According to local tradition, the Ojibwe called the river Busabikazibi, “river where water flows through a worn place in the rocks.” The name “Lester” likely came from an early settler—most of Duluth’s creeks are named for settlers who arrived at the Head of the Lakes in the 1850s. In 1901, Baltimore resident George V. Leicester wrote to the short-lived Duluth Historical Society (1898 to 1902) that he was preparing a paper for the organization explaining that he was the river’s namesake. The News Tribune reported that Leicester claimed the river was named for him (Lester is the British pronunciation of Leicester) after he lived for one winter in a cabin on its banks prior to ratification of the 1854 Treaty of LaPointe, which opened the northern shores of Lake Superior to settlement. The fact that Leicester, born in 1837, was just seventeen years old in 1854 certainly lends some doubt to his claims. According to records, Mr. Leicester died in Maryland in 1902 at the age of 65; his place of birth is not recorded. The Lester River was already a favorite location for summer activities. As early as 1884, Thomas Buckley leased two hundred acres along the river with the goal of establishing a summer resort. Buckley constructed a sixteen-by-twenty-six-foot building near the mouth of the river and created a carriage road from there to the falls. He intended to capitalize on the most popular activities by selling fishing tackle along with food and beverages for picnickers. Newspaper ads announced that the steamship Mary Martini would make excursions from Duluth to the Lester River, charging a fare of fifty cents for a round trip, and invited picnickers to visit the summer resort at Lester Falls Park, where “all kinds of temperance refreshments” were available. For the simple pleasure of the view as seen from the car window the one taking this six mile ride is well repaid. The bright green woods, the wild flowers, the fields of freshly mown hay and yellowing grain, the trim, new cottages, and the pure, sweet air—they are the elixir of life to the nostrils of [the] tired man or woman from the hot, palpitating city! Sargent’s intention to create a park along the river was well known; in May 1886 the Duluth Weekly Tribune reported that brush fires threatened to destroy the birch grove “which Lakeside Land Company intends to be the central attraction of their future park.” Fortunately, Sargent and a group of men fought back the flames and saved the birch grove. A carriage path, Occidental Boulevard, paralleled the west side of Amity Creek; another path, Oriental Boulevard, paralleled the east side of the creek (today Oriental Boulevard is part of the park’s cross-country ski trail system). The park also included a strip of land along the east side of the river from Superior Street to Lake Superior. Several years earlier the Lakeside Land Company had donated land on the west side of the river for the U.S. Fish Hatchery. In 1891 state legislation turned the Village of Lakeside into the City of Lakeside in anticipation of the inevitable annexation of the community by Duluth. After a lively fight among local politicians, compromises were reached and the annexation of Lakeside went into effect on January 1, 1893. Following annexation, Lakeside and Lester Park became neighborhoods of the greater city, and the Lakeside Land Company donated Stearns Park and five public squares in Lakeside to Duluth’s expanding park system. While Duluth’s park board welcomed the gift of Stearns Park, it wasn’t financially prepared for the addition as it had overextended its budget working to acquire land and make improvements to the parkway, Chester Park, and Lincoln Park. 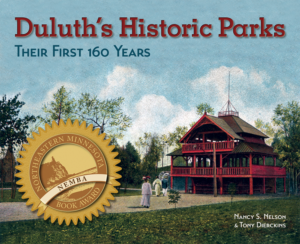 Nevertheless, in its annual report for 1894, the board graciously wrote that “the people of Duluth are indebted to the generosity of the Lakeside Land Co. for the gift of this magnificent tract of land for park purposes.” The board renamed the greenspace “Lester River Park,” but it was soon referred to as simply Lester Park. Every bright, pleasant morning during the week, picnic parties go from town and spend the day at Lester Park…. They have an abundant and tempting lunch, wraps, hammocks or a swing, and a bit of sewing for the older women. The girls generally tuck away a novel among the sandwiches for private delectation along in the afternoon after the excitement of arrival and lunch is over. Lester Park also became a favorite place for dances, which were held within one or another of the many pavilions. 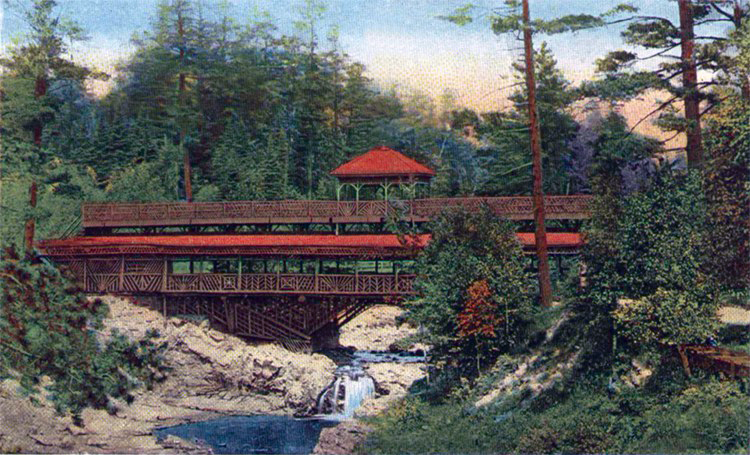 It is difficult to pin down the exact number and location of pavilions and concession stands that existed in and around Lester Park at the beginning of the twentieth century, but the most famous was the Lester River Rustic Bridge, which spanned the river in the heart of the park from 1898 to 1931.